Now some philosofic considerations. Look at figure 1. 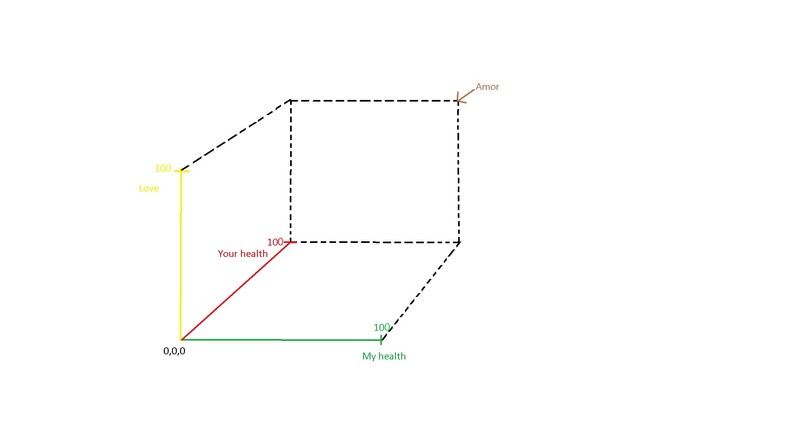 The first key to find is the green key; I, my health. Like a tree growing slowly. The second key to find is the yellow key; Love. Like a sun shining always on, giving energy and life. The third key to find is the red key; You, your health. Like a flower we need to guard, with all our efforts. The product of these three keys is Amor. English has not yet a direct and precise word for Amor. I name it 'Telove'. 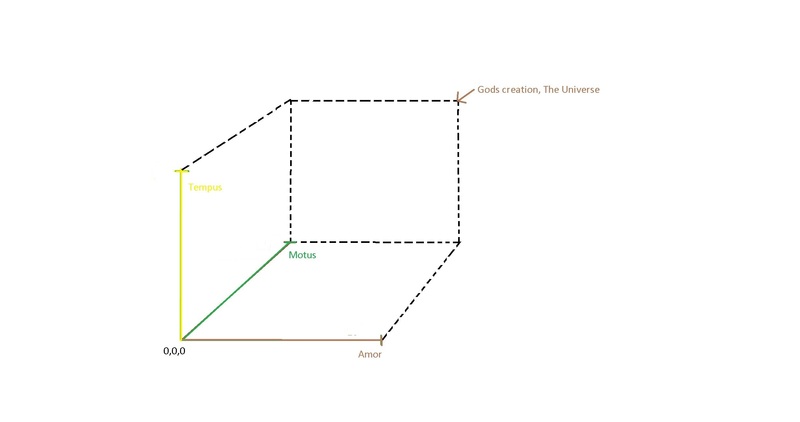 As you see of figure 2; Amor is one of the keystones to build the universe. God created The Universe based on three keystones: Amor, Tempus and Motus. So God wanted all life within the Universe to love eachother. If one of the factors reach zero, the universe will zero out, and cease to exist. If 'Telove' goes downward, then The Universe gets smaller. Pass this document of Amor to as many persons as possible, so we may save the Universe - and also the planet Earth. Consider the formula Amor = I * Love * You. First came I; a volume with the unit m3. Then came You; a volume with the unit m3. Then add the power to love; with the unit m-3. Then write the formula I m3 * Love m-3 * You m3 = Amor with the unit m3. So I * love * You create a new volume or a sphere of Amor. Amor and the power to love are two different factors. The power to love is an internal volume. Our bodies are filled inside with the power to love. Is the power to love 100%, then our bodies have the purest feeling and spirit of to love. If simultaneous our healths are 100%, then we create the perfect and complete Amor. © To Abnescio, 22. April 2017. All Rights Reserved. Edited 3. september 2018.